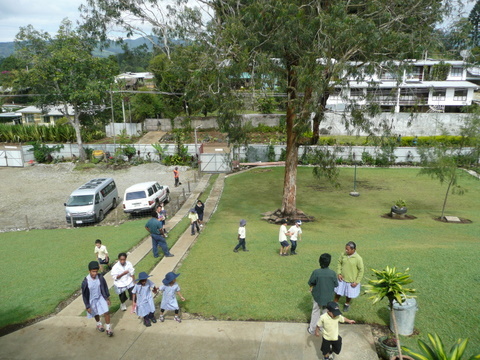 Highlands Christian Grammar School is not a participant in the OLPC program, and was not on my planned itinerary of schools to visit in PNG. I had the good fortune—serendipity—of being able to visit it because I met the principal of the school (Joy Pryor) while staying at the Baptist Transit Flat in Mt Hagen, PNG. 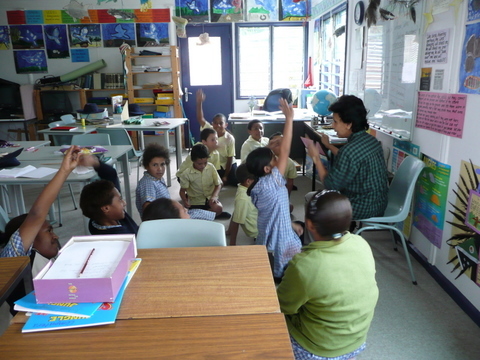 Joy had left her native New Zealand to come and start a primary/grammar school, basically from scratch, in Mt. Hagen. The founding of this school was intended to address the dissatisfaction with the quality of schooling available in Hagen on the part of a number of Baptists and/or community leaders in the Hagen area—in other words, she had a mandate to create a grammar school of superior quality to anything that had existed previously in the area. Anyway, back to the school. The classes at this school were very small: 8-12 students per class, which allowed for quite a bit of individual teacher attention for the students, and the teachers that I met all appeared to be extremely well-trained and comfortable using technology—although this wasn’t always of the computer-variety. 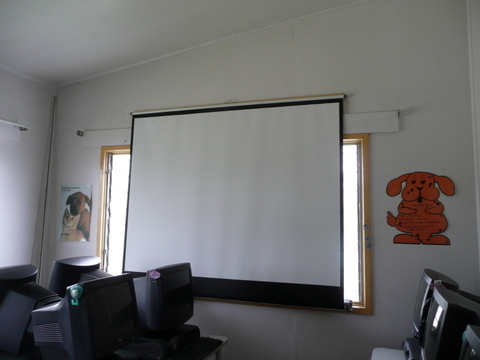 The teachers at this school actually had access to—and I watched all of them use—the peripherals that nearly all of the OLPC-project teachers express the desire to have, in order to complement their computer usage: Whiteboards, and printers, in particular. This school also had a projector, and a beautiful library full of (donated) books. There were two (old! donated) computers in each classroom, and a computer lab as well, full of (again, quite old, energy-hungry, donated) bulky desktop computers. 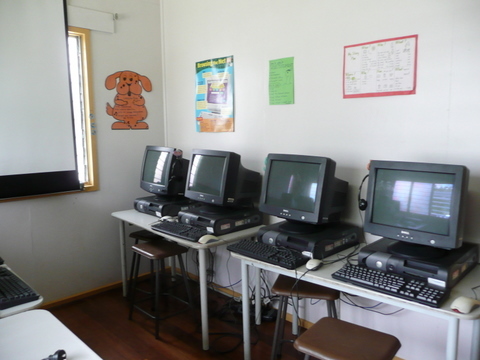 The computers in the classrooms were used occasionally, for watching videos, playing games when students had finished an assignment early, etc. 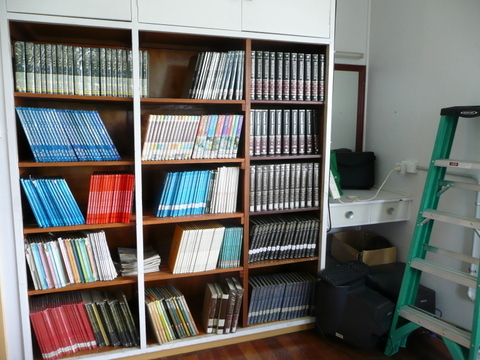 The computer lab was used for the older students learning how to type, and how to do research. (And yes, when I asked, these computers’ power requirements were a large expense for the school.) 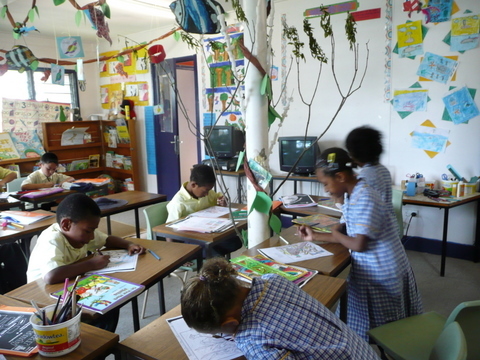 This school had the luxury of having access to things that the OLPC schools didn’t necessarily have—like paper for the students to draw, paint, and make artwork with, etc. Thus, they weren’t generally using the computers for these purposes. This was a night-and-day difference from a school I was to visit later, which had no paper nor printers, so the OLPC XOs were serving as the medium for the students to practice and display (if not keep forever) their art skills and artwork. 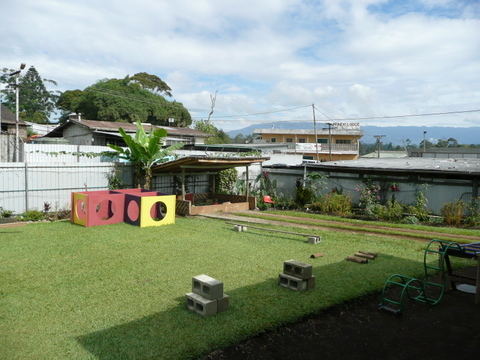 In the end, this school faced a number of different challenges from the schools with the OLPC laptops that I visited. It was privileged and wealthier in a number of ways. However, this did not mean that there were not challenges! I remain beyond impressed by how Joy was able to come in (as a foreigner), and set up a school from scratch, establishing relationships with all kinds of people, from local teachers to men willing to guard the building—in just 18 months! She had to sort through the cast-off technology and all manner of other well-intentioned donations, in order to set up the school with the right kind of learning tools for the students. 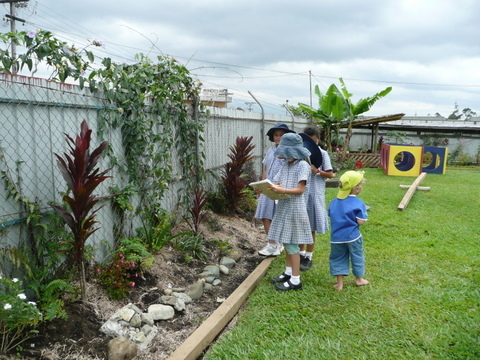 She had vision—in abundance—for how she wanted the school to be operating, both now and in the future, from the grounds of the school (to include multiple athletic and game-playing areas,) to curriculum development, which she was working on developing in collaboration with a local educator, James Suki, who was also my contact in Mt Hagen, and who had brought me to the Jim Taylor school the day before. 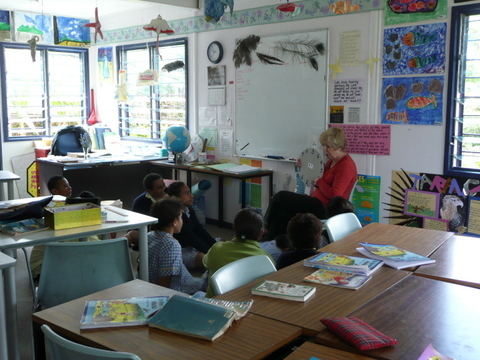 As we spoke about this curriculum development, they let me know that it was possible that their efforts would have a much wider reach than just to the Highlands Christian Grammar School—James had been speaking with the Minister of Education, who had recently been charged with developing new curriculum for all the schools in PNG, and since James and Joy were already working on this curriculum, and would basically be presenting a finished product to the Minister….there’s a good chance it could be adopted—in part or in whole—on a much broader basis. And that’s where the politics enters the picture, once again!!! 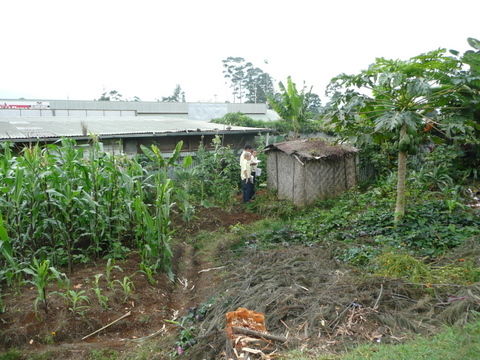 Next post: On to Kiunga! 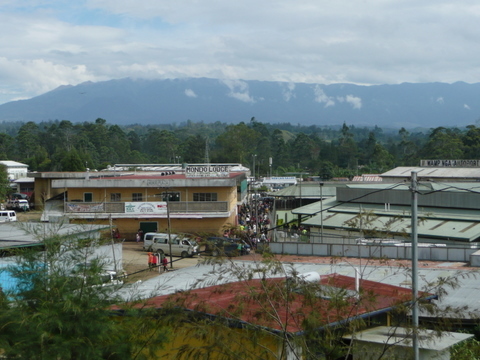 This entry was posted in Pacific Islands, Papua New Guinea, Uncategorized. Bookmark the permalink. Many thanks for the photo you sent us and just now I have read your write-up of your visit to the school . What a wonderful account! Thank you so much. As you know computers in PNG are not always reliable and for whatever reason we didn’t find your story to now. We are back in NZ for Christmas with our daughter, son-in-law and 3 grandchildren in the little central north island town of Taupo. Hi, thought you might be interested to know that Joy retired (again) at the end of 2011 and I came to be Principal at HCG. We now have new computers in the school, a one-to-one tablet program in grades 7/8, interactive data projector and satellite internet. We still face huge issues with appropriate network maintenance and support. However, teachers and kids have come a long way building on those early days. It brings tears to my eyes reading this article and looking at the photos. I pray for this little school most nights, that it would always be a light on the hill and that the curriculum that my mother put together would always be the foundation of this beautiful school. My mother, Joy Pryor, has now since retired from this life and is now in eternity with her loving Heavenly Father. 23.11.41-29.07.15. 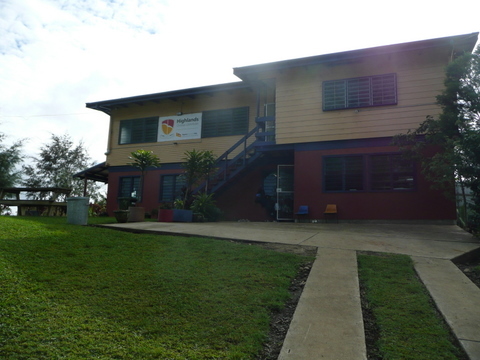 I pray that this little school will continue to grow from strength to strength. “But David found strength in the LORD his God.” (30:6b, NIV) This is my prayer for this school that all who enter in will find strength in the Lord, as David did.